3D printing turns a digital model into a three-dimensional object by adding material layer-by-layer. 3D printing has been used to create houses inspired by everything from the structure of bone to silkworm fibers, functional musical instruments, and even biosynthetic organs. For an introduction to this technology in greater detail, 3D Printing Industry (3DPI) shares its history, processes, and applications in their Beginner’s Guide (no download necessary). The 3D printing industry has experienced incredible growth over the past decade. 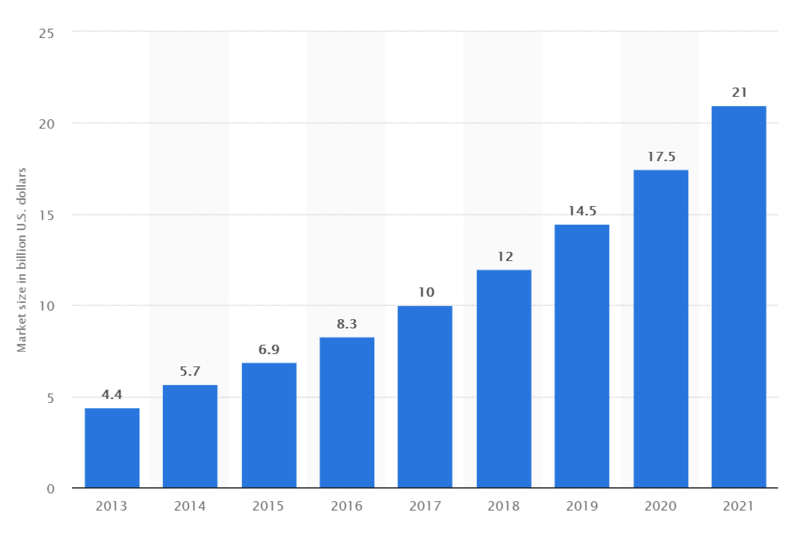 According to Statista, the global 3D printing market size is expected to reach 21 billion USD in 2021. Size of the global 3D printing market, 2013 to 2021. 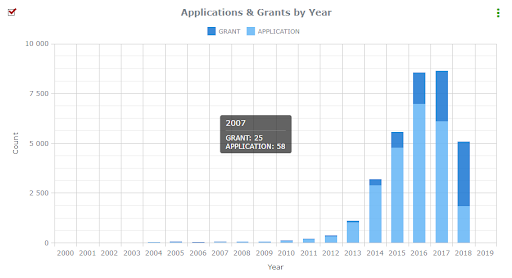 A search through ktMINE’s database for related patents (using search terms “3D print*,” “3-D print*,” and “additive manufactur*” for more comprehensive results) shows that 58 applications were submitted and 25 granted back in 2007. 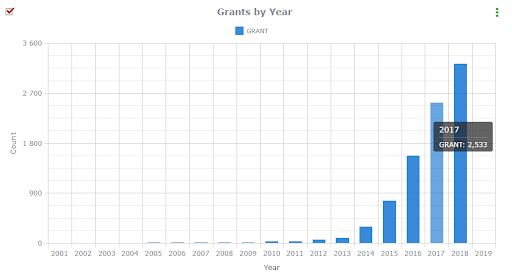 By comparison, 2,533 related patents were granted in 2017, a more than 100-fold increase over the course of a decade. Clearly, the size of the 3D printing industry is rising at a rapid pace, and patent filers are realizing that intellectual property protections will play an important role in capitalizing on this growth. …the ability [of 3D printers] to copy and replicate is the ability to infringe on copyright, patent, and trademark. But the ability to copy and replicate is also the ability to create, expand upon, and innovate. Just as with the printing press, the copy machine, and the personal computer before it, some people will see 3D printing as a disruptive threat. Similarly, just as with the printing press, the copy machine, and the personal computer, some people will see 3D printing as a groundbreaking tool to spread creativity and knowledge. It is critical that those who fear not stop those who are inspired. Weinberg’s white paper thoroughly considered the opportunities and challenges posed by the inevitable rise of 3D printing, from potential patent infringement to trademark violations. In the over eight years since its publication, investigating the complexities of the relationship between 3D printing and intellectual property has become fairly popular. The topic has recently been explored by Industry Week, Richmond Journal of Law & Technology, and WIPO Magazine (all articles from 2017). In 2018, the European Parliament issued a resolution on 3D printing, which included a call for the European Commission to consider revising Liability and Intellectual Property Rights regulations for this technology in the EU. 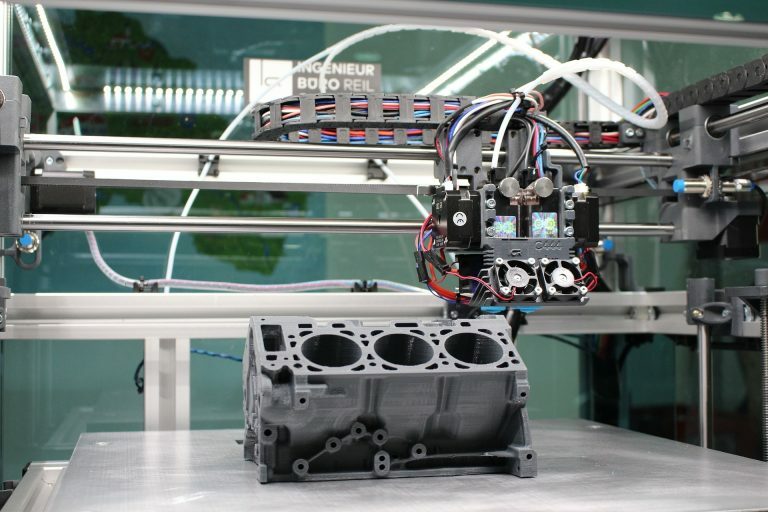 CECIMO, a European association representing the common interests of the machine tool industries globally and within the European Union, noted in a press release that the resolution “risks stifling innovation in 3D printing,” and could negatively impact the widespread adoption of 3D printing technology. 3D printing technology has the potential to upend (or render essentially useless) traditional intellectual property protections. New legislation involving IP protection should balance the requirements and needs of business versus consumer uses of 3D printing, and governments must take a careful and measured approach to avoid inhibiting creativity and innovation in this industry. As a ktMINE research analyst, Julia Justusson processes and examines intellectual property daily. Interested in tracking innovation across various fields through IP, she uses ktMINE to identify IP patterns that can provide insight into a company’s strategy and industry trends. © 2019 Copyright ktMINE. All rights reserved.